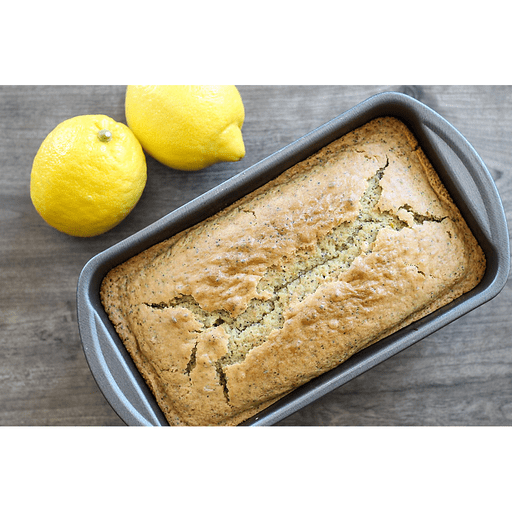 Our Lemon Poppy Seed Bread is filled with fresh, lemon-y flavor, and it also packs a nutritional punch thanks to a secret ingredient — olive oil! 1. Preheat oven to 350°F. Spray a 9x5-inch loaf pan with cooking spray. 1. In a large bowl, whisk together flour, baking powder, baking soda and salt. Add poppy seeds, sugar and lemon zest and stir to mix. 1. In a separate bowl, whisk together lemon juice, milk, eggs and olive oil. Add wet mixture to the dry ingredients and stir until completely combined. 1. Transfer batter to loaf pan and bake for 55 minutes or until done. Remove from oven and allow to cool for 10 minutes before removing from pan and allowing bread to cool completely before slicing and serving. For dairy free: Use unsweetened milk alternative in place of milk. For gluten free: Use gluten free all purpose flour in place of whole wheat pastry flour. Calories 260, Total Fat 8g (Saturated 1.5g, Trans 0g), Cholesterol 30mg, Sodium 310mg, Total Carbohydrate 43g (Dietary Fiber 4g, Sugars 18g), Protein 5g, Vitamin A 2%, Vitamin C 4%, Calcium 10%, Iron 8% *Nutritional values are an approximation. Actual nutritional values may vary due to preparation techniques, variations related to suppliers, regional and seasonal differences, or rounding.